A wonderful gift or a little treat for yourself and your door!! 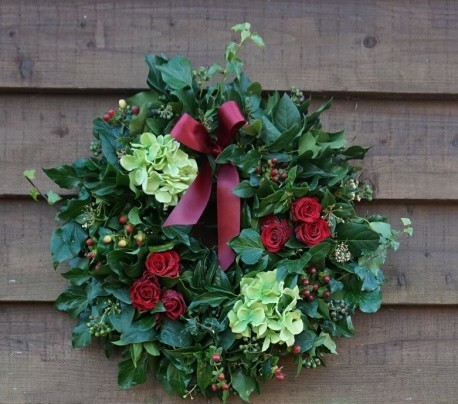 This fresh wreath is sure to get you in the festive mood, it is arranged on an oasis base and comes complete with a loop, so all you need to do is hang it on your door. Fresh burgandy red roses, artificial hydrangea, hypericum berry, and beautiful green foliage including Holly and Ivy. This ring of scrumptious flowers and foliage is completed with a red satin simple bow. The flowers and foliage are delivered directly from the flower markets in the Netherlands to ensure the upmost best quality available. The Standard wreath measures approximately 17 inches across and the Deluxe sized wreath is approximately 22 inches across. To keep your wreath in perfect condition water the oasis every week or when it feels dry to the touch. If you would like a different bespoke design please call me to discuss further.